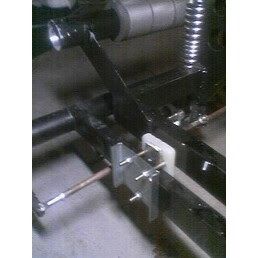 The shock mount problem is specific to 2007/2008 models. The shock mounts were too short on the 2007/2008 models. Mark Murphy, the designer of the BugE kits has informed the group that later models will not have this problem. Still, there may be some BugEs on the road that never had this issue fixed. It's referred to as the "chitty-chitty-Bang-Bang" phenomena since the "Bang" is the cowl meeting the frame as the vehicle goes over bumps. 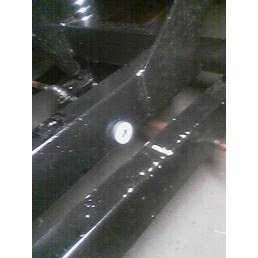 One remedy is to install plates to lift the bottom shock mount so the shock can move a longer distance over bumps. The plates I installed are similar to the photo on the left (photo by Fred_dot_u). A custom set of these plates were made for me by another BugE builder, Sammy L. Rogers. Thanks Sammy! Another way to fix this would be to lift the whole cowl up slightly by using the "cowl retrofit" kit which was offered at a later time by BlueSky. Most owners I suspect have done one or both of these solutions. If using the plate solution, I discovered another problem. Originally, a stabilizer bar was present which allowed up-down movement with only a little bit of side-to-side movement. With the inner frame section lifted, the geometry of the stabilizer bar changed so it would cause an exaggerated side-to-side movement. Over time, this side-to-side movement could fatigue the central shock mount enough to eventually cause a failure. Here's one way to correct the stabilizer problem. The approach is to discard the stabilizer bar entirely and instead use two assemblies on each side of the outside frame that allows up-down but not right-left movement of the inner frame. The parts are quite basic. 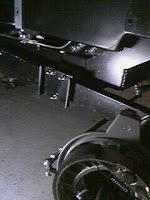 Two slider pads are mounted towards the bottom of the inner frame (see image). The sliders on either side of the inner frame then press against pieces of slippery plastic on either side of the outer frame. The section of plastic is supported from behind by small pieces of thick strap iron so the material stays stiff. This arrangement gives a slippery, yet firm surface which limits side-to-side movement while still allowing up-down movement. The parts for a retrofit are quite simple. The sliders are "as seen on TV" sliders available at Home Depot. A cut down section of plastic cutting board makes a slippery and rust-proof sliding surface. 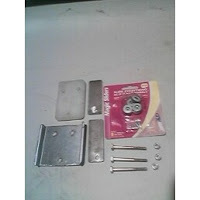 The metal support pieces are simply some 3 1/4"sections of strap iron I use for spacers with a hole for the bottom bolt to secure them. Bolts are 2 1/2" 1/4x20 with nylock nuts. The metal piece with the three holes were made from sheet metal. The edges are bent up give it a stiffer strength. The photo on the left is the left-side assembly installed for a test fit to show how the parts would go together. Jumping up and down on the inner frame shows smooth movement up and down but virtually no right-left movement. Very fun to prove! The next photo on the right shows the right-hand assembly installed with the battery tray and cowl sections installed. The painted assembly was trimmed down for clearance. The further forward the assembly can be moved, the more clearance from the battery tray lip it will have. Had I mounted the sliders all the way at the end of the inner frame, the original untrimmed assembly would have allowed quite a bit of movement before encountering the bottom of the cowl. However, it is my hope I never encounter a bump requiring even close to that amount of movement! I've put around 200 miles with this stabilizer arrangement. I have found some pretty big pot holes for testing and the BugE goes over them just fine. While doing frame work, I also thought I might correct another problem too. This photo is an image of a small fiberglass wall I made out of 4 sheets of fiberglass cloth made stiff with fiberglass resin. This wall, working with the existing splatter shield, limits the amount of spatter from the rear wheel that makes it to the rear electronics. It also stops drips moving along the top of the body section as well. 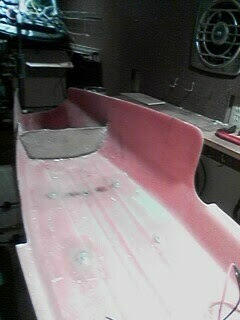 Since I had more cloth and resin left over, I also converted the seat bolts to permanent fiberglass hard points too. In rain, this wall works well. When I first tried it, a little spatter would make the rear of the DC-DC controller wet. I've since extended the length with a two inch rubber skirt held on by rivets which has taken care of that problem. I also found that the foot wells would collect small puddles of water from my wet shoes. So I drilled two holes at the far ends of each foot well so that water could drain out. These small modifications seemed to have taken care of the rain issues.